If you search your ancestors in Patrica, Lazio, info about your Italian family are stored in the City Office archives or at the parishes. In towns and villages of Lazio and in Frosinone province registry offices were established in early 1800: it means that you could find information in Patrica registrar as of that date. So, if your ancestors were in Patrica in the nineteenth or twentieth century, then you could try to contact the City Office of Patrica to know more. Before to start your genealogy research in Patrica, we suggest you to read our tips for your search . They are useful to search in Lazio and in Patrica too. 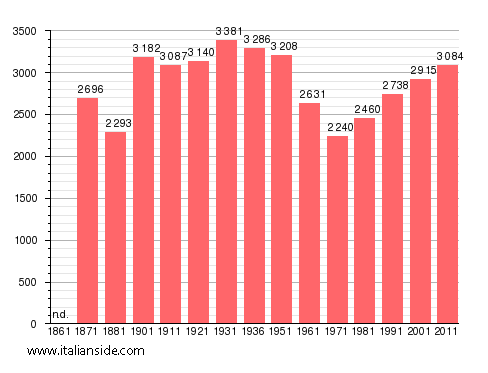 Next picture shows the demographic trends in Patrica from the Italian Unification (1861) an important info to understand how many people lived there in the past. It could be important to know if the last name you are investigating is a frequent surname in Patrica. As more your surname is common in Patrica, as more it could be difficult to find the right info about your ancestors in Patrica archives if you have not exact dates. Alonzi, Bianchi, Campoli, Carnevale, De Santis, Evangelista, Fiorini, Gabriele, Iafrate, Lisi, Mancini, Martini, Palombo, Rea, Ricci, Rossi, Scaccia, Spaziani, Valente, Venditti. Church archives in Frosinone province may instead contain even older information, but they are far less accessible from abroad (and almost impossible by email). If you have the opportunity to visit Patrica and Frosinone province, you could plan to investigate churches’ archives by yourself, but from abroad is very difficult to obtain any result unless you find a reliable local help. 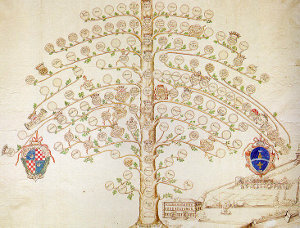 If your research is in a dead end and you need professional help from our local Italian genealogists write to patrica@italianside.com our expert in Patrica area will study your request and will reply to you with a research plan and a quote. I am looking for more information on my grandfather’s parents. He was baptized in Patrica. His name was Guido Montini and his mother was Maria Cappadozzi d’Arcangelo and his father Luigi Montini fu Giovianni. I am looking for information about my great grandmother, Teresa born March 21, 1881. She married Vincenzo Conti in Patrica and immigrated with their children to Ambridge, PA, having several other children once there. Her maiden name was CORANI (as indicated on her 1916 ship manifest and on one of her son’s, Romeo’s birth certificate); however, many of her children list BELLI as her maiden name on their death certificates. The family story is that she was born a twin and that her family could not raise both children, so she was given to an orphanage. Knowing this, perhaps her adopted name is Belli. I know a lot about Vincenzo’s extended family, but not about hers. She had red hair and it was told that she met her birth father at some point and was surprised to see that he also had red hair. It was also said that he baked bread in outdoor ovens. That is the extent I know about her extended family, so I am looking for information on her birth parents, her twin, etc. Corani=biological Belli= adopted? I found more information on this. Teresa was born to father, Ubaldo Corani who had a fruit stand/floral stand in Rome. She was given the name Belli when taken to Santo Spirito. She was fostered by a Battisti family in Patrica. and I believe a son named Giacinto…though there may be others as well. 1. I have also been able to trace Rocco Conti who settled in Aliquippa (son of Giuseppe Conti and Mary Steffanacci) who married Caroline Guerrieri (with daughters who married into the Ciotti and Colonna families), and I can’t help but wonder if his wife is connected to Puritana Guerrieri in Patrica, perhaps a niece as she is one generation younger. I have DNA matches to this branch as well, but am unable to figure out how it connects. 2. Additionally, I know that Filomena Conti (daughter of Giuseppe Conti and Antoinette Ruscitti?) who married Antonio Refice and settled in Aliquippa (with daughters who married into the Simoni and Spaziani families) is also connected through DNA. Antonio lists his mother as Mary Staffanacci, just like Rocco, but his father is Luigi Refice. Does anyone know if Antonio could be Rocco’s half brother and this is how it all connects? I know that is a lot of information, but I am hoping someone will connect to a name on the list! Thank you! Myself and my two sisters are planning at trip to Patrica in September 2018 …. Our Grandfather Serafino Simoni born in Patrica came to Aliquippa, PA. Serafino (Sam) had three siblings, Leonoda, Massimino and Savinto. Their fathers name was Rocco Simoni married to ?. Sam who married Emelia Conti was also from Patrica. Our grandmother Emelia’s parents were Louis Conti and Josephine Baldassara. . My wife and I have been to Patrica before and enjoyed our visit and found the area and cemetery very interesting. Our Mom Leona Simoni, married a Colonna (Roland), who’s family also came from Patrica. Our Great Grandfather on our Dad’s side name was Luigi Colonna, who married Rosa Macciomei, they had three sons Gusippi, Savirio and Marino (Carlo) our grandfather. Our grand mother on our Dad’s side also came from Patrica and her name was Maria Stella Del Greco. Maria Del Greco’s parent were Naziro Del Greco and Carlina Mansuette. We are interested in continuing our education about our heritage and the people of Patrica any help in this regard would be appreciated. Quisiera información sobre mi abuelo paterno Vittorio Bufalini. Is there any connection to Mary Stefanacci, either as a mother to Rocco Conti (father Guiseppe/Joseph Conti) or as a mother to Antonio Refice (father Luigi Refice)? They are both on my tree with that name, both, as mother, all from Patrica. I have branches off both so I am wondering how this is connected. Im due to retire in the next three years and Im planning on going to Greece and Italy to vist the towns my families came from. My mothers side are from patrica. Her grandfather my great grandfathers name was Giuseppe Stefanacci. From what I know he came over in the early 1900’s. and settled in Ambridge Pa. He was a cobbler by trade. My grand mother told me as a child 1920’s they moved back to patrica for a few years then came back to the us. I was wondering if there was any Stefanacci’s still living in Patrica. Hi, I am looking for any information regarding my family. I am trying to make a family tree for My 2 little girls. My great grandfather’s family, last name Frioni, came over on the boat from Patrica, Italy. Though he, himself, was the youngest of his siblings, or at least one of the youngest &he is not listed on immigration records. We believe he might have been born in America, but are not sure if he was in fact, if he was still in the womb, or exact details as he passed away around 30years ago. My great grandmother who he married came over around the same time, but she, her first name was Emily, &her family, were actually from what is now Austria, but was still part of Italy at the time. Both their families settled in Aliquippa, Pa, West Aliquippa, plan 12. My great grandfather passed away before my great grandmother, when some of their children, one being my grandfather, were still adolescents. Their other children were grown & having kids of their own. Some time later she remarried & married Bill Edling, changing her last name to Edling as well as the young children’s, one being my Grandfather George Edling, who sadly passed away last year at the age of 73. My great grandfather, as well as his sons were in the US military &thus my family moved around quite a bit & their children were born along the way. Most of which remained in Aliquippa, Pa. My great grandmother passed away some 20years ago & my second great grandfather Bill Edling, remarried shortly after to Rose, he passed away just a few years ago, in Colorado, in his 90’s. He was cremated, half of his ashes stayed in Colorado, &the other half were brought back to Pennsylvania to be buried next to my great grandmother Emily. Most of My family is buried in the old Catholic cemetery on broadhead rd,Hopewell/Aliquippa, Pa. Sorry, I know that’s a lot, just hoping it might help, thx! I am trying to find information about the families of my grandparents, who were both from Patrica, were married in the church of San Rocco and emigrated to the United States in the early 1900s: Rocco Evangelisti was born in 1873 and Carmella Bombiani was born in 1885. Thanks. My husbands family is from Patrica and emigrated to Aliquippa, PA. We will be traveling to Patrica in June of this year. The family name is Chimile but i believe it was Americanized. Oliver Chimile was born in 1923 in Patrica. Any hints or connections would be very helpful. Both my paternal grandparents came from Patrica. My grandfather was John or Peter Rinaldi and my Grandmother was Ugalina Simoni. They were first cousins and they married in Patrica in 1915 while my grandfather was home from leave from the front during WWI. He came to the USA in 1906 and returned for a visit to Patrica in 1911. He was conscripted and was involved in the Turkish war fighting for Libya. He emigrated to the USA with his wife and two children in 1920. He settled in Aliquippa PA and later moved to Detroit, Michigan where he worked for Packard Motor Cars. He retired from that position. In his later years, he received a small pension for his military service in Italy. Hello, my family came from Patrica in 1906. My 2nd great grandfather, Guiseppe Simoni, brought his three sons ( Luigi, Safrino, and Pietro) with him to Aliquippa Pa. Luging and Safrino married two sisters from Patrica, Antolia and Antonia Refice. Giuseppe returned to Italy and had a daughter, Norina. His wife never came. I believe they died in Patrica. I’m looking for help regarding lineage and perhaps family. Any help would be great! Thank you. Jason ….. Myself and my two sisters are planning at trip to Patrica in September 2018 …. Our Grandfather Serafino Simoni born in Patrica came to Aliquippa, PA. Serafino (Sam) who married Emelia Conti also from Patrica had three siblings, Leonoda, Massimino and Savinto. My wife and I have been to Patrica before and enjoyed our visit and found the cemetery very interesting. Our Mom Leona Simoni, married a Colonna (Roland), who’s family also came from Patrica. Our Grandfather on our Dad’s side name was Luigi Colonna, who married Rosa Macciomei, they had three sons Gusippi, Savirio and Marino (Carlo). We are interested in continuing our education about our heritage and the people of Patrica. Hello, I’m looking to find out family history about my grandparents and ancestors on my father’s side of the family. The names are Costanza and Mansueti, both from Patrica. My Great grandfather was Domenico Costanza from Patrica, and he seems to be related to all the Costanza’s from Herminie and Aliqippa Pa. I wonder if our Costanza’s are the same. Hello Maria, My paternal grandmothers maiden name was Mansueti from Patrick. Her name was Anna Mansueti born around 1885 or so. Have you had any luck getting information? I’m looking for any information for the surname, Pellegrini. My great-grandfather was Luigi Pellegrini born Sept 23, 1893 or 1891 and he was from Patrica. He came to America at the age of 17. I would like to know if I still have family in Patrica. Any information is welcome. Thank you. My dads first cousins last name was Fineteri. My dads moms sister whose last name was Buffolini. married a Fineteri. They were from Patrica. There also were priests and nuns in their family. Did u find any relatives when you visited. Looking for family history information for Tolfa, Erme, Camponia, and Minnotti names. Know that Tolfa, Erme and Camponia were from Patrica. If you would like to start a research in Patrica please send your request to patrica@italianside.com.